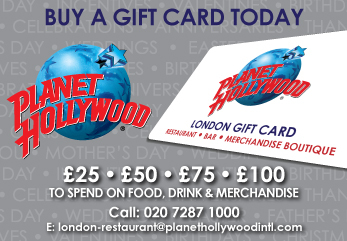 Planet Hollywood London opened its doors in its’ original Trocadero Centre location on the 17th May 1993 in London’s buzzing Piccadilly Circus and earlier this year celebrated 25 amazing years in London. 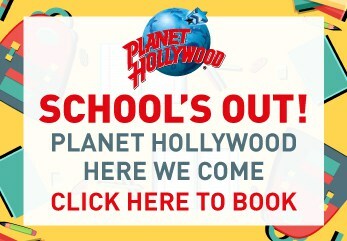 In 2009 Planet Hollywood moved into its new home on the Haymarket (only a 3 minute walk from Piccadilly Circus). Planet Hollywood London boasts a large cocktail bar open ’til late, along with several themed areas : The Bond Room, British Room and our Beach Bar style Cabanas room. 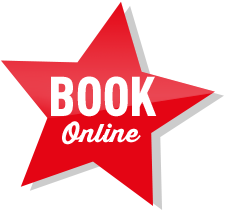 There are over 85 pieces of iconic movie memorabilia on display plus our popular Wall of Celebrity Handprints. Plus you can Get Your Fame On with a great selection of branded merchandise on sale in our boutique including T-shirts, sweatshirts, caps, hoodies, glassware, key rings, bags, fridge magnets and toys.